← “To Kill a Mockingbird”: Great Book But Not a Great Novel? Walt Whitman: Patron Saint of … Bloggers? I’m going to go completely off-topic for this post. It’s coming up on my fifth-month anniversary of blogging . . . it’s a brisk 8 degrees out there in frozen New Jersey . . . and I feel like connecting. Not reviewing, not analyzing, not dissecting . . . just. . . connecting. So instead of writing about one of The Books That Mattered as I’ve been doing for the past five months, I’m going to spend a few moments talking about Walt Whitman. The good gray poet who spent the latter part of his life in Camden, NJ–not too many miles from where I sit looking out my window at the frozen tundra that used to be my back yard. Back in the day, before blogging and tweeting and texting and YouTubing, back even before emails and surfing the web, I used to think this poem was about . . . writing poetry. But now that I’m both older and younger than I was back then, it dawns on me that “A Noiseless Patient Spider” is not just about writing poetry, not even just about writing, it is really about trying to make a connection . . . any kind of connection. And really, when you think about it, what are all these blogs and tweets and texts, but all of us noiseless, patient spiders isolated on our little promontories, relentlessly sending out these little filaments of ourselves, hoping that they catch somewhere. Keeping track of the number of hits we’ve managed to generate, checking our in-boxes for comments, hoping against hope that our posts or tweets or YouTube videos or whatever we’re sending out there will have made a connection with someone, somewhere. And that thought warms my soul a bit. Because the fact that so many of us are involved in this brave, foolish, all-too-human enterprise suggests that poor, isolated, misunderstood Walt Whitman was right. That we are all noiseless, patient spiders trying to connect with each other any which way we can. And in a way that he never could have foreseen, after 150 years Walt’s silvery filaments are still reaching out across time and space, still catching hold. What a great little post. Different from your other posts, but I really liked it. And, I’m not a big consumer of poetry, but love that poem you chose. Thanks so much. I’ve been enjoying doing my longer, in-depth posts for The Books That Mattered. But I’ve been thinking that I should mix things up somewhat with some shorter posts as well. So you can look for more of a mixed bag as we move along. Thanks again for following along and commenting. Really loved this post, Erich. Thanks so much, Diahann. Means a lot coming from one of my favorite bloggers. Thanks so much for your kind comment. Isn’t it funny . . . I’ve known and loved that poem forever. But it suddenly sprang to life in my mind when I started thinking about it in the context of blogging and tweeting and YouTubing and the way we are all communicating these days. And, I agree, spiders are way cool. 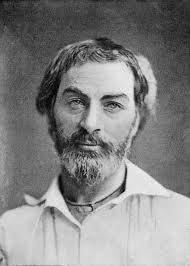 I am fairly new to Whitman…but the more I read him, the more I love him! Wonderful post! I always believe we are in this thing called life separately, yet together. And I happen to adore old grizzle face! A stack of books on the floor by my bookcase has Leaves Of Grass right there, front and center. Thanks for sharing through your blog. Thanks so much. I couldn’t agree with you more . 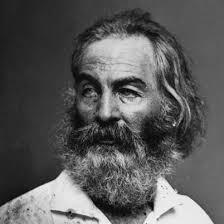 . . think I’ll try to do more sharing of things I love (like that Whitman poem). What a great interpretation of a lovely poem (that I have never read before), thanks! Gee, thanks so much Cathy. I’ve actually had that poem framed and sitting next to my desk for years . . . I’m so glad that you enjoyed it. I enjoyed your post and words. It does make me think in all this connectedness throughout the world, the more isolated we become. Most words spoken in texts, tweets and even blogs, are nothing but blah, blah, blah, yet we read and quickly forget. Face to face is becoming a thing of the past. Just watch the kids texting on their phones – they are right in front of each other, face in phone. The spider has his world, the one under his control, yet needs his long line to seek out into the world beyond, a world not always safe. I enjoyed the Frost poem you left on my blog. You are very well read. Yes, I totally agree that the more “connected” we become through our various devices, the less truly connected we are in actuality. But I guess — with texts and tweets and blogs — at least we are making an attempt at communicating and connecting. Which, I suppose, is still a good thing. Thanks so much for your thoughtful comments re/ “The Wood-Pile” — see if you can get hold of the whole poem (I only sent along about half of it). It’s a fantastic treatment of the difference between the natural and man-made world. Thanks for your kind words. It’s a poem that I’ve kept next to my writing desk and computer for many years. Whenever I question myself and my writing I give it a quick read and it never fails to give me a tiny boost of inspiration. What a wonderful poem — I love the way you weave the poem’s theme into our current preoccupation with blogging and tweeting and facebooking, etc. Thx! Thank you so much. It’s always been one of my favorite poems and just seemed so apt to describe how I feel when I write a new blog post and send it out there.